Our winery lies in the charming area of Valdobbiadene, where the vineyards gracefully cover the hills. We are in the historic territory of Prosecco Superiore D.O.C.G. Campion, the name of our winery, comes from the name of the land itself, one of the most renowned in the whole area. Our vineyards inlcude land on the prestigious Cartizze location. 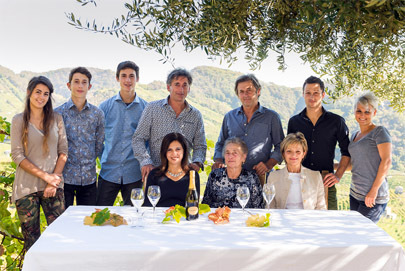 The tradition of producing wines and sparkling wines has been handed down in our family for generations. Our modern winery was born in the late ‘60s, thanks to the courage, sacrifice and passion of our father Gregorio, who dedicated many years of his life to this important project, along with his wife Lea. Today Francesco and Fernando continue the work of their late father. They strive to produce a high-quality wine by respecting traditions and making use of the latest technology. We manage all of the phases of production personally, from the vineyards to your glass. To fully allow you to experience all this territory has to offer, you can stay at our Farmhouse. Thanks to the restoration of the premises of the winery, four large and comfortable rooms have been created to offer our guests the opportunity to spend pleasant and quiet moments in a place full of love: for the land, family and authentic feelings of life.